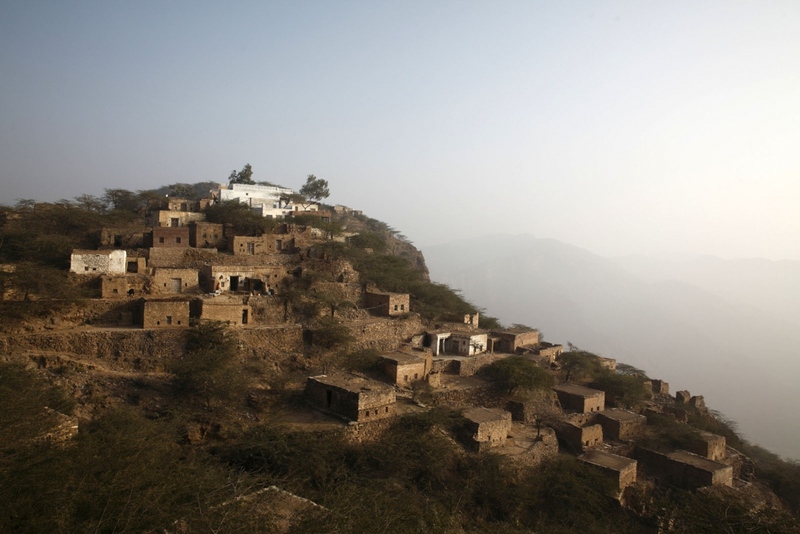 Perched on a mountain top, this small village is occupied entirely by salt miners who work in the Khewra salt mine below them. Punjab, Pakistan. 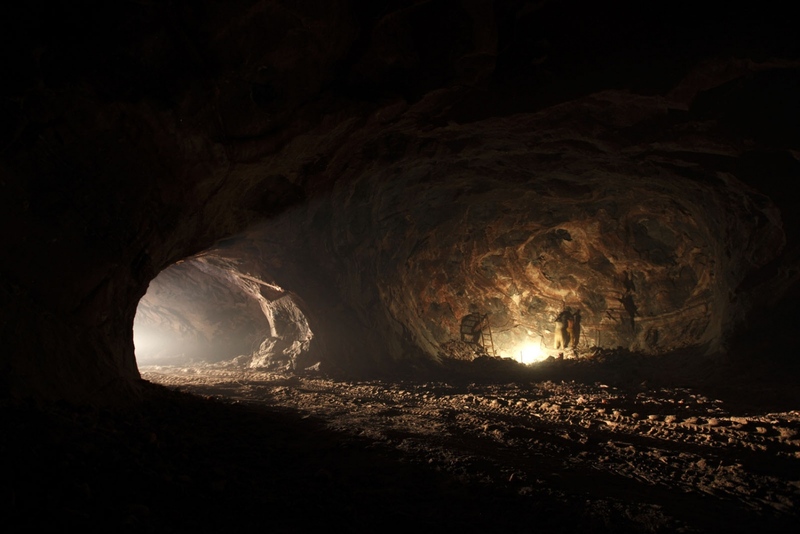 The pitch black mine shafts of the Warcha salt mine, only illuminated by gas lamps or the occasional passing truck. Everything inside the mine from floor to ceiling is made of salt. Punjab, Pakistan. 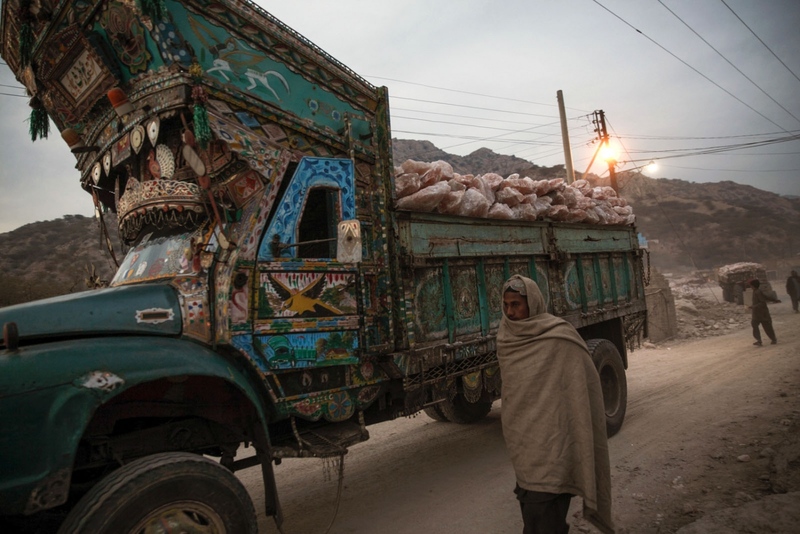 Pakistan's elaborate trucks collect tonnes of the pink rock salt at a distribution area at the Warcha mine. Punjab, Pakistan. 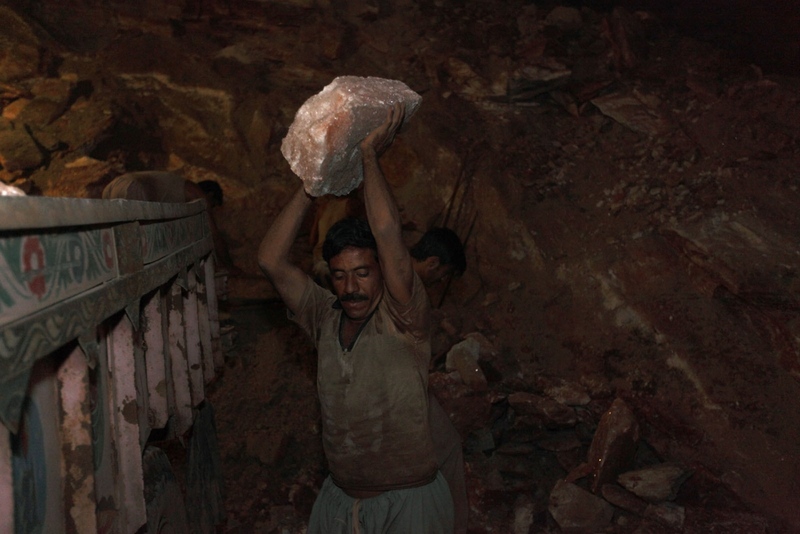 Salt workers toil in pitch darkness inside the Khewra salt mine. 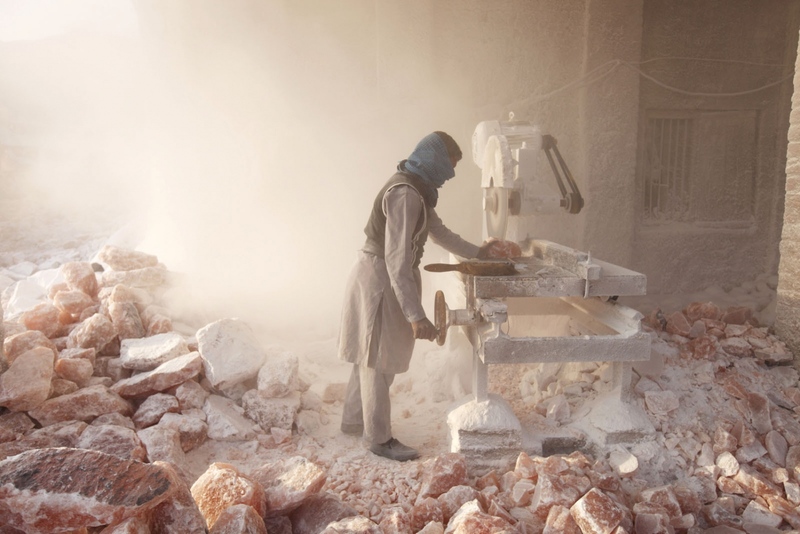 Once the salt is blown from the walls by a concoction of gun-powder and chemicals the workers break up the large chunks and carry them on to trunks that drive in and out of the mine. Punjab, Pakistan. A salt workers in the darkness of the Warcha salt mine. Punjab, Pakistan. 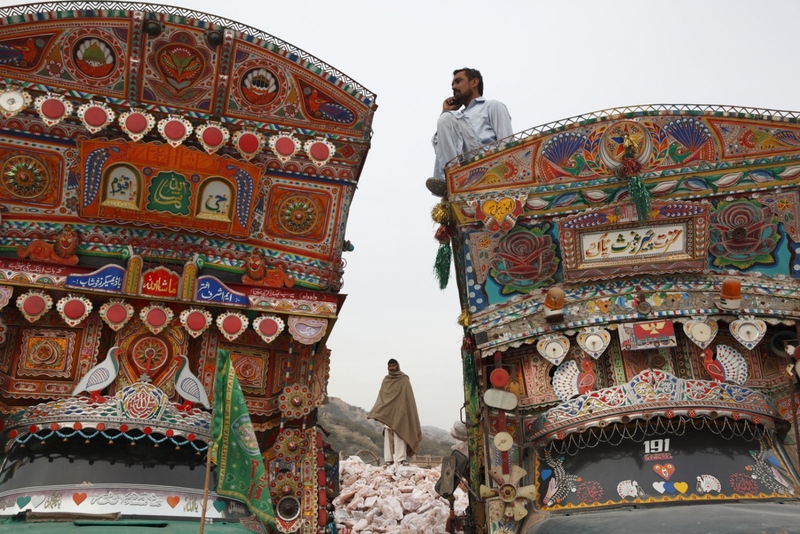 Men load a truck with salt from Khewra Salt mine to be driven south to Karachi. 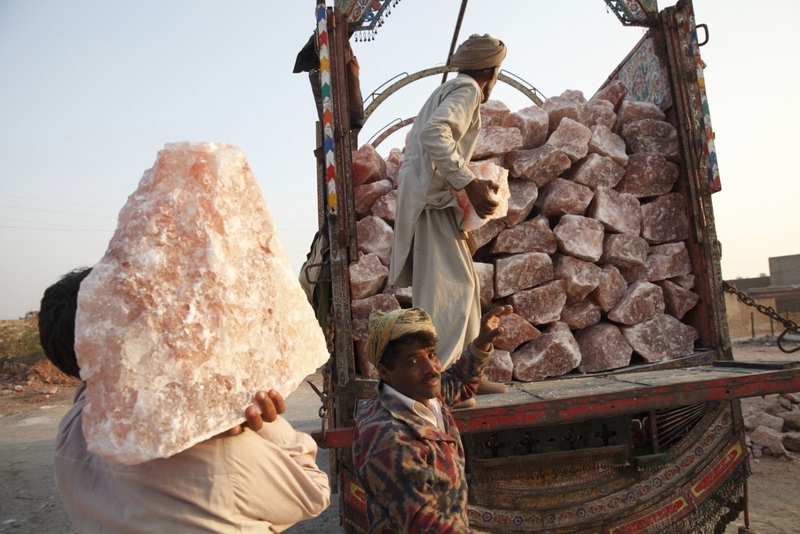 Very few places in the world have pink rock salt and Pakistan holds by far the most. Punjab, Pakistan. 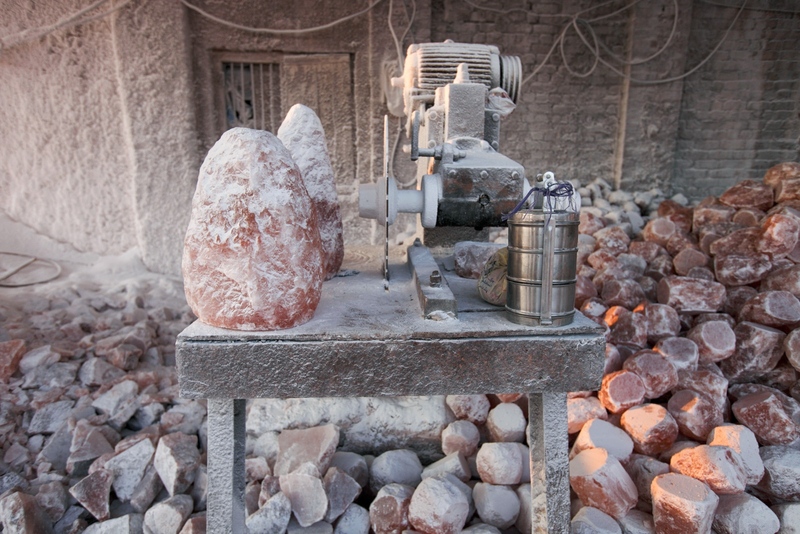 A salt cutting workshop uses a mechanised saw to cut up the salt in to blocks sending salt dust in to the air. 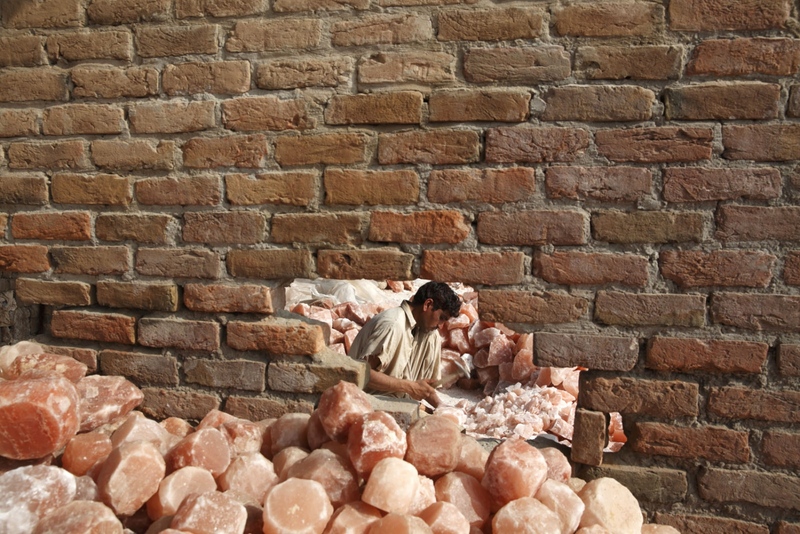 Local people also carve the beautiful pink rock salt in household objects ranging from ashtrays to lamps which are then send and sold at tourist shops. Punjab, Pakistan. A truck laden with tonnes of rock salt leaves the Warcha salt mine at dusk. Punjab, Pakistan. Salt miners houses are illuminated on the hillside above the Warcha salt mines below them. 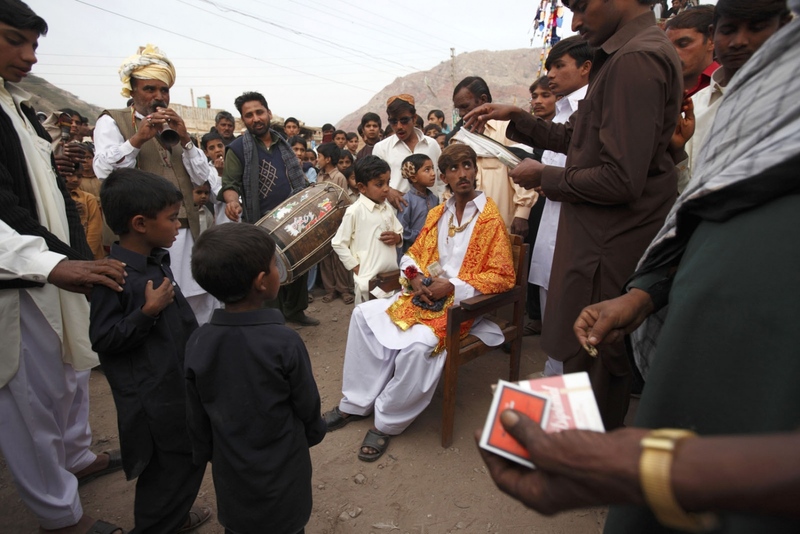 A wedding celebration is held for a salt worker inside the grounds of the Warcha salt mine. Punjab, Pakistan. At the Warcha mine every truck containing salt is documented as it leaves the mine in large account books. The entire accounting system of all the mines remain hand-written. Punjab, Pakistan. 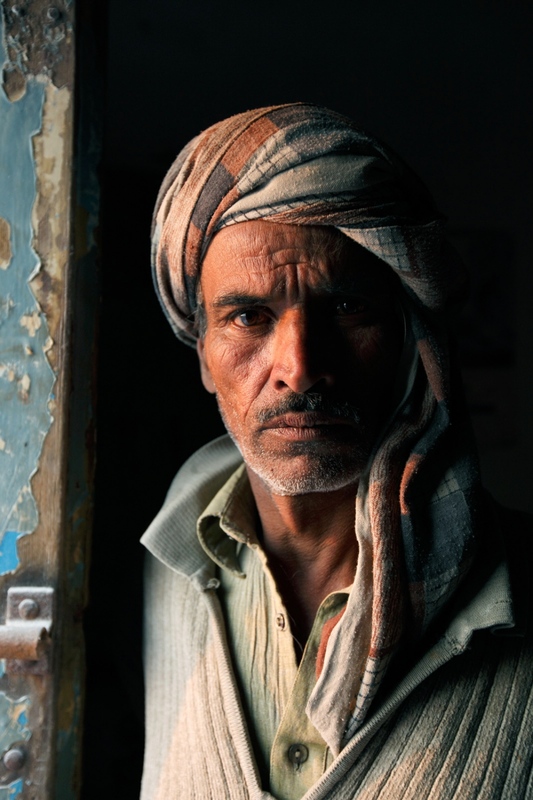 A salt carver stands in the doorway of his workshop at the distribution area of the Khewra Salt mine. 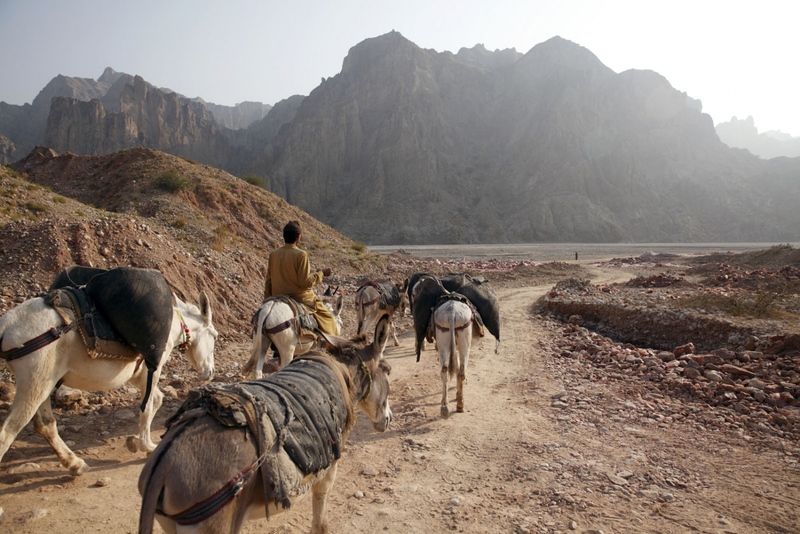 Throughout the night donkeys are still used at the remote Kalabagh salt mine. Reaching areas that tractors still can't get to, the donkeys carry the rock salt to areas that is then collected and taken out of the mine during the day by tractors. 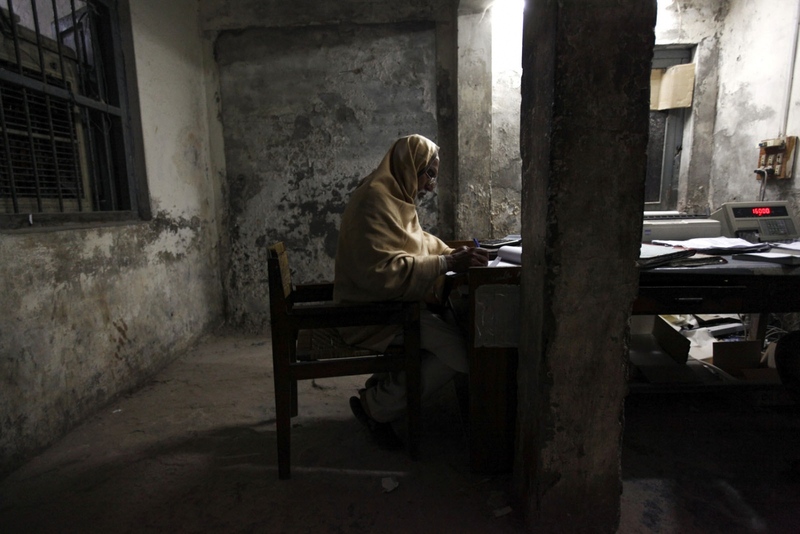 A Pakistani man sits on a boat that ferries people to the kalabargh salt mine. Punjab, Pakistan. 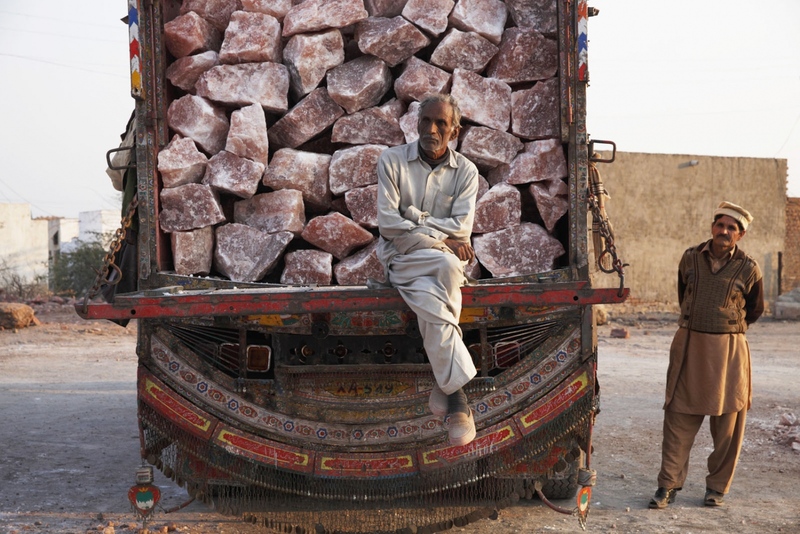 Men loads up a trailer with large pieces of pink rock salt recently excavated from the Kalabargh salt mine. Punjab, Pakistan. A salt miner loads a truck with rock salt after blasting the salt from the mine walls with dynamite at the Warcha salt mine. 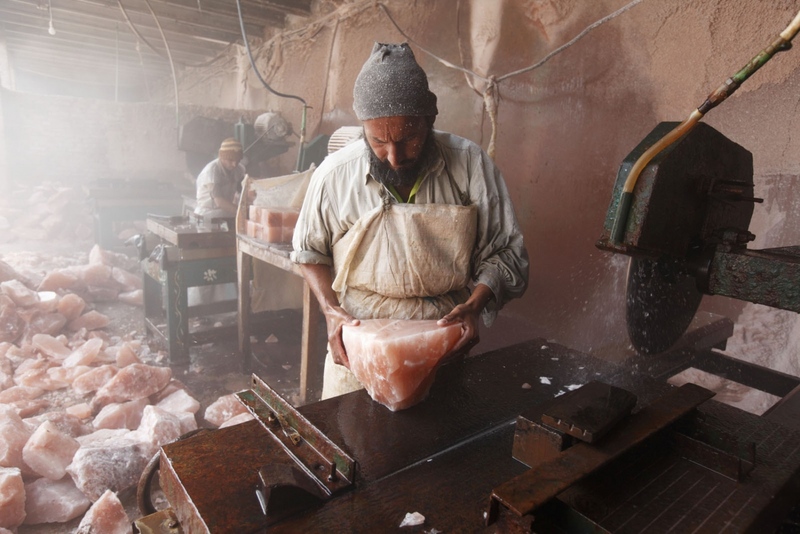 In a salt cutting factory near Kalabargh, a man from Karachi works cutting salt blocks in to smaller cubes with a circular saw. These salt blocks are then carve further to make objects for the tourist souvenir market such as candle holders and ashtrays. Punjab, Pakistan. 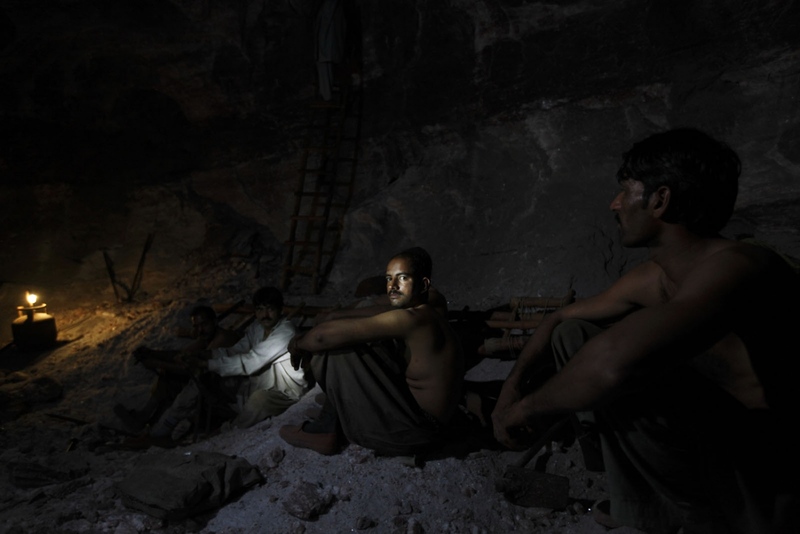 A group of salt miners take a rest inside the dark depths of the Khewra salt mine. Punjab, Pakistan. 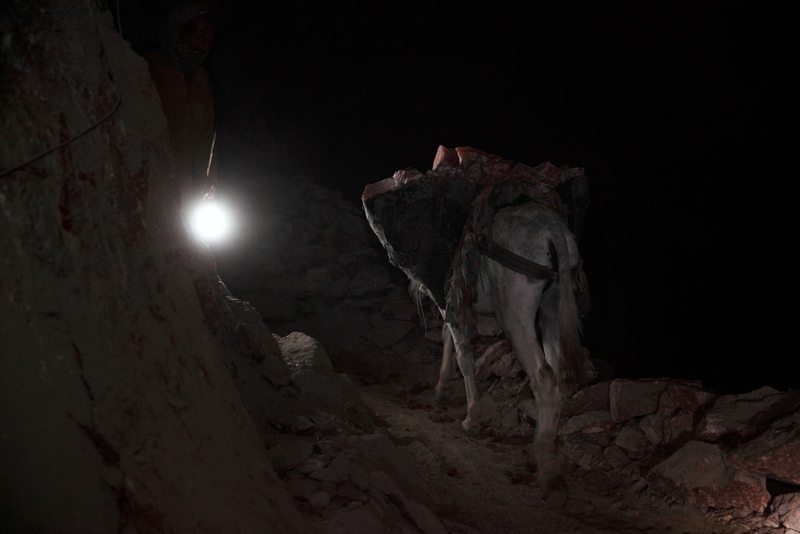 A salt workers in the darkness of the Kalabargh salt mine. Punjab, Pakistan. 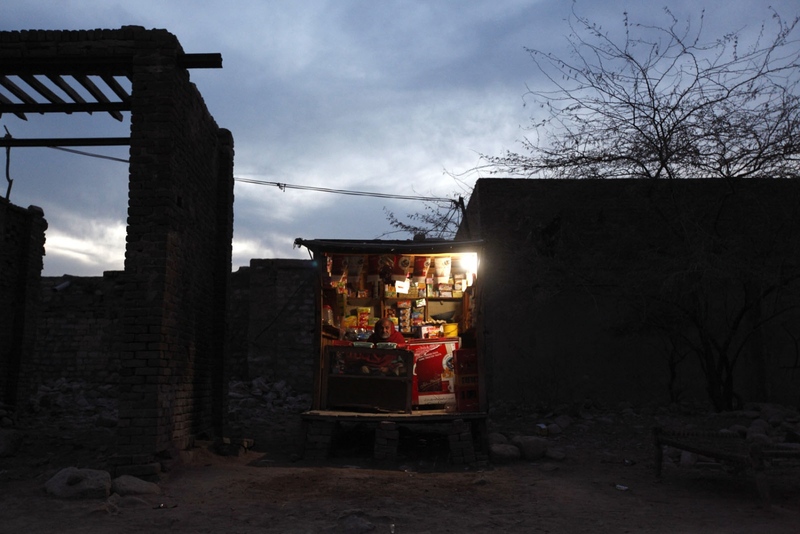 A man runs his small shop in the grounds of the Warcha salt mine with all of his customers being salt workers. Punjab, Pakistan. At a salt carving factory a many trims salt bricks in to cubes ready to be carved in to objects such as candle holders or ash-trays. Punjab, Pakistan. 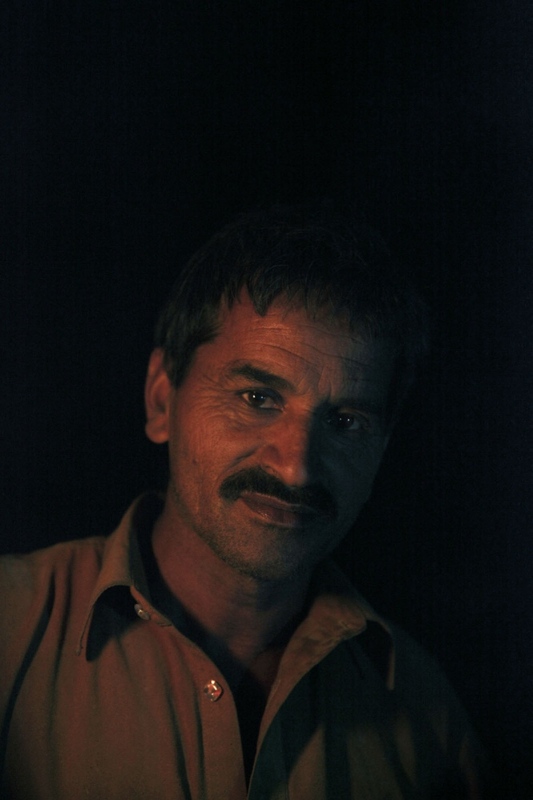 A salt carvers table at the end of his shift at Khewra Salt mine. Inside the remote Kalabagh salt mine donkey's are still used to reach the areas unaccessible to trucks. 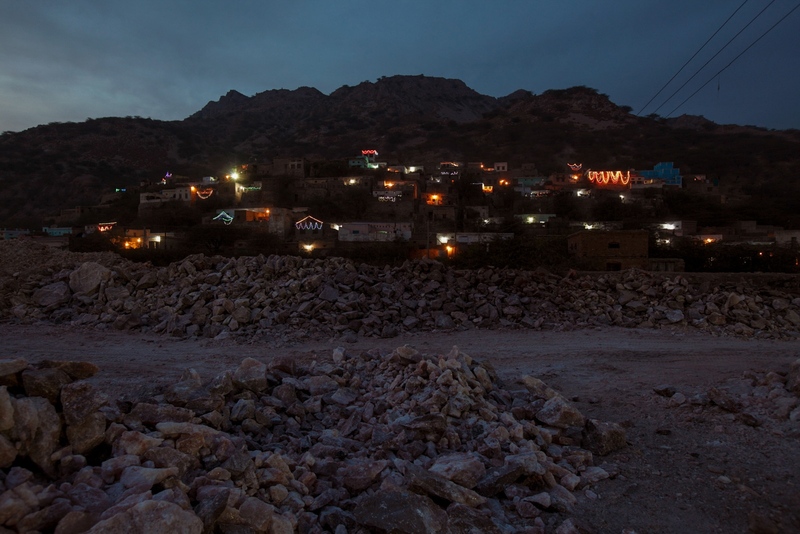 The Kalabagh mine is one of the most remote salt mines in Punjab Province and has developed slowly due to its proximity to the dangerous Pakistani Tribal areas. Punjab, Pakistan. 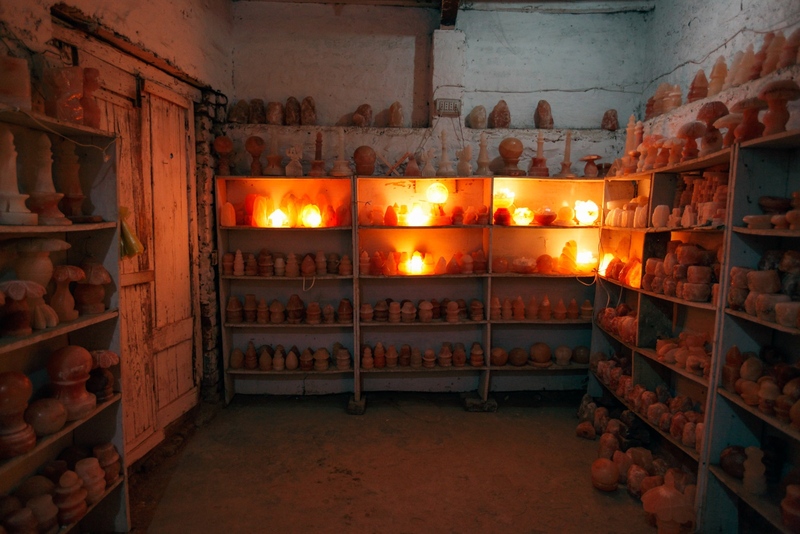 Objects carved out of pink rock salt extracted from the Khewra salt mine are exhibited at this small simple shop which sells the objects to the occaisional visitor. 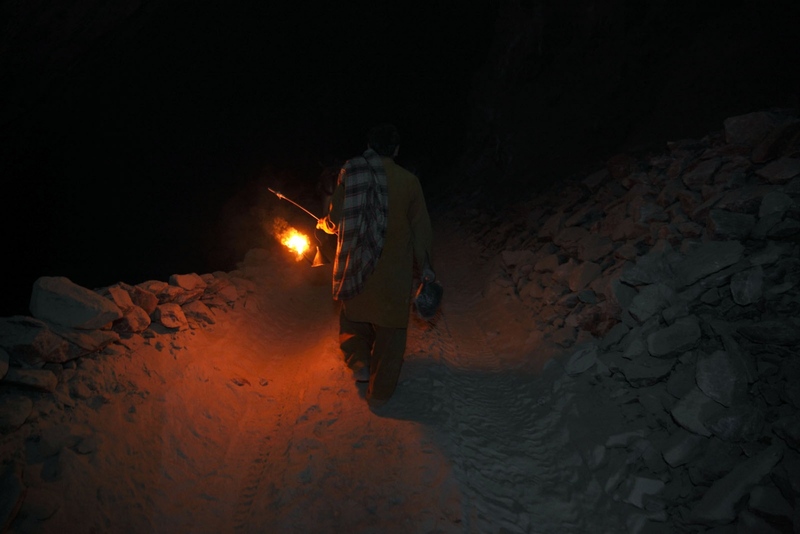 A salt miner walks through the mine after his shift has finished at the Kalabagh salt mine. 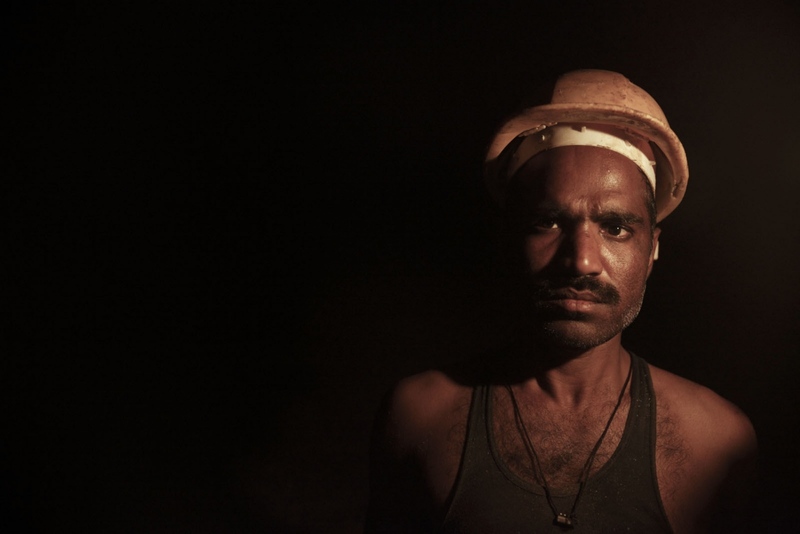 Light from his small oil-burning lantern is all he has to find his way out. Punjab, Pakistan. The 300km long Kohistan-e-Namak mountain range in Northern Pakistan is home to one of the largest deposits of rock salt in the world. Six large mines, and countless smaller ones, cut away at the mountains interior mining the pink rock salt that forms the range. Unique to Pakistan, every year millions of tonnes of pink rock salt is mined here, some of it carved and exported to the west as an expensive and unique culinary experience. Urban legend says that Alexander the Great in 326BC formed a large encampment in the area, after discovering the salt when his horses began to lick the rock. Thus was the birth of an ancient salt mining traditional in the area that still continues today. In 1872 the British took over the mining rights in the region and the first British Chief Mining Engineer, Dr H Warth, made the Khewra salt mine his home and began to introduced new mining techniques used in Britain and the rest of the world at the time. The British continued to control the mines until Partition in 1947 when they were returned to Pakistani control. Although today the mines are controlled by the Pakistan Mining Development Corporation the same miner families, having received their hereditary rights from their forefathers, continue to work inside the salt mines. 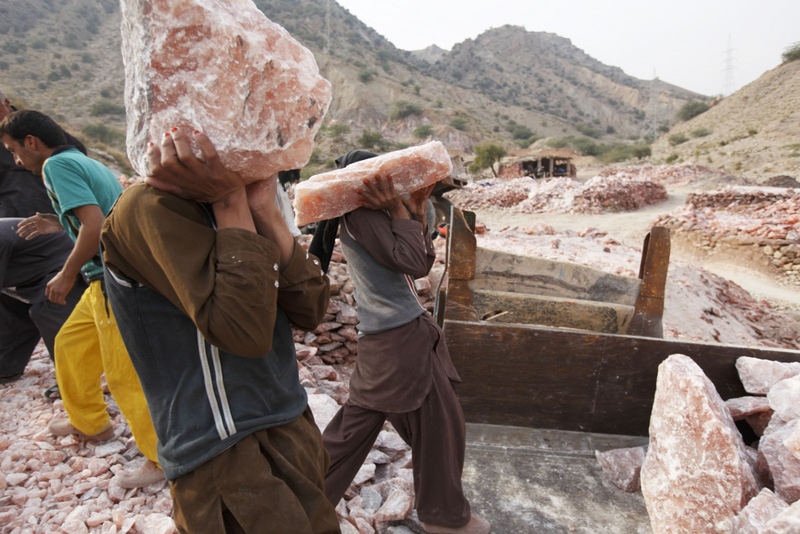 Whilst other salt mines across the world have become more mechanised many of Pakistan’s salt mines still use the same techniques employed in 1872. Work is still largely done by dynamite and by hand with some mines still using donkey’s to carry out the salt. It is the strength of the salt miners Unions and the hereditary registration rights that refuses to allow the mines to become mechanised for fear the miners will lose their jobs. First published in the book Salz der Erde by mareVerlag in Germany in 2016. By Luke Duggleby — A community struggle against an outside entity is all consuming for those involved. They are the people of the land but are forced to use all their..
By Luke Duggleby — Vietnam’s Mekong Delta is one of the world's areas most ‘at-risk’ from the effects of climate change, which is likely to pose..
By Luke Duggleby — In the Northeastern Province of Loei is the community environmental group of Khon Rak Ban Kerd (Villagers Who Love Their Home). This idyllic corner..
By Luke Duggleby — Marine ecologists and conservationists believe that the biggest single threat to marine ecosystems today is overfishing. Our appetite for fish is..
By Luke Duggleby — A selection of work shot for NGO's, Corporate Social Responsibility projects and Developmental work for clients such as USAID, Greenpeace, Fortify..
By Luke Duggleby — On September 24 th 2017, the last remaining Afro-Sri Lankan’s commemorated what they believe to be their 500-year anniversary of their..
By Luke Duggleby — The Cardamom Mountains remains one of Southeast Asia's last great forests. One of the largest and most pristine areas of intact forest in Southeast..
By Luke Duggleby — On 12th November 2012, two Thai women were found dead at the edge of a palm oil plantation, a mere 800 meters from the sand-bagged security post..
By Luke Duggleby — With thousands of miles of porous borders, Thailand is continuously fighting illicit international trades. The border with Laos is over 1700km long..
By Luke Duggleby — Taken for granted in modern times salt remains one of the most important minerals for human survival. Our bodies demand it. Since we walked this..
By Luke Duggleby — Much study and documentation has been done into the Western movement of slaves from Africa, that forcibly brought over 10 million Africans across..
By Luke Duggleby — DAGESTAN Located in the North Caucasus, bordering the Caspian Sea, Azerbaijan and Chechnya, Dagestan is home to almost 3 million mostly Muslim..
By Luke Duggleby — Our planet is at a critical point in time. We understand more than we ever have about our planet, yet it is at even more of a threat. 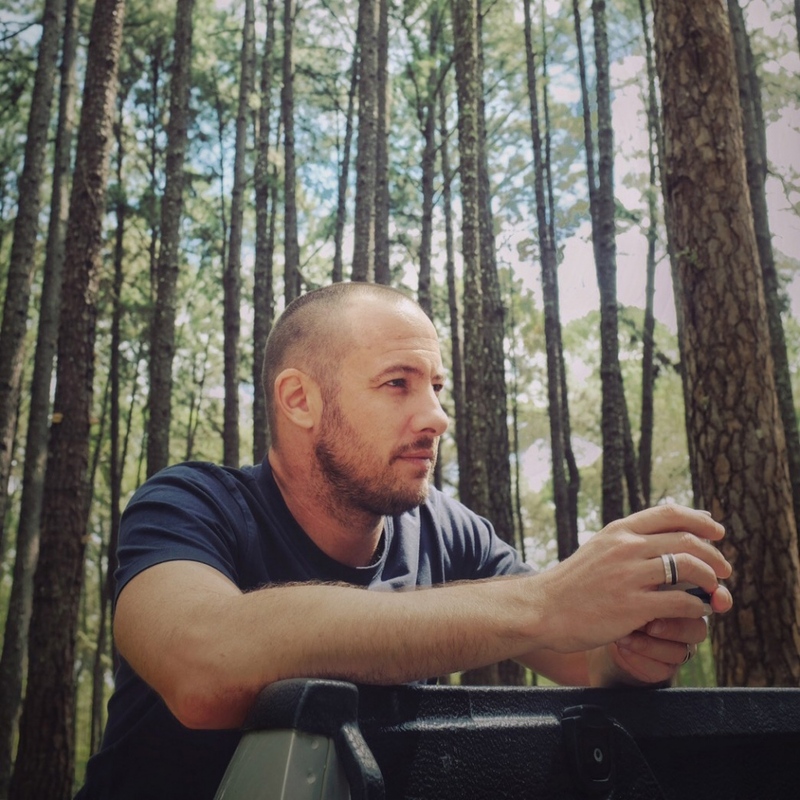 Today, an..
By Luke Duggleby — On July 31 st 2015 the enclaves that formed one of the world's most complicated borders were officially absorbed in to the countries that..